Subscribe via RSS 2.0 or Atom! I've spent a far amount of time this week working on making it easier (or even possible in some cases) to build libpurple3 on OSX. 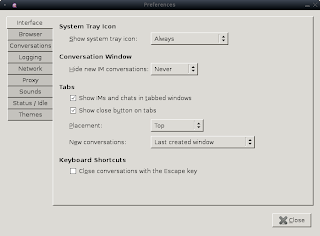 I haven't gotten to Gtk+ yet, so I haven't even tried compiling Pidgin yet. Most of the issues have been in the generation of the configure script and landed in PR #103. But there was a side effect from an earlier PR that became a problem on OSX since homebrew does not have farstream. PR #107 has been submitted to fix that. Homebrew attempts to play things very safe, which is admirable, but a giant pain when you're actually trying to compile something that isn't already in Homebrew. So we go about making this easier by using a little known feature of Pidgin's build system. CONFIGURE_FLAGS="--disable-gtkui --disable-consoleui --disable-vv --disable-kwallet --disable-meanwhile --disable-avahi --disable-dbus --disable-gnome-keyring --enable-introspection"
As you can see, I'm disabling a ton of stuff to make this build work, but that's not all. Notice the PKG_CONFIG_PATH environment variable being exported. This is dealing with Homebrew's policy of staying out of the system's way. OSX has it's own version of libffi and libxml2 so Homebrew will not install any part of those packages where the system will look for them. This has the unfortunate side effect of causing weird build failures until you realize this is the problem. Junk security reporting for cash — and credit? A few times a year, Pidgin gets a rash of junk security reports from “independent security researchers”. Typically we get 3–5 or more reports in the span of just a couple of days, reporting “vulnerabilities” such as HTTP POST submission of plain-text passwords to TLS-encrypted GNU Mailman subscription preferences login. (As many of you will know, by default Mailman will email your password to you every month. In addition, password retrieval is as simple as entering a subscribed email address and waiting for the password to arrive in that address’s inbox.) The report typically also asks for consideration in the form of a bounty or finder’s fee. The security flaw being reported is trivial-to-irrelevant. The mechanism by which the flaw operates is often protocol- or configuration-related, such as the presence or absence of certain HTTP headers or the method used for a form submission. The report does not indicate that the “researcher” understands the flaw or even personally verified its existence; often one gets the feeling from this and the previous point that it was identified by an automated tool. The reporter shows no understanding of the entity being contacted, often (for example) referring to the Pidgin project as a “company” or suggesting that it is a large and wealthy organization. The reporter asks for some sort of reward. All of the reports in a given burst come from the same general locale, often India. The first three points on this list make the reports seldom useful and somewhat of a nuisance. The third point, in particular, means that when the reporter receives a polite reply to the effect of “we know, it’s not a problem and here’s why,” they often persist in repeating textbook explanations of the flaw with no reference to the effective implications of the problem (or lack thereof). Sometimes this degenerates into threats of exploitation or disclosure to the highest bidder, though not often. The fourth and fifth points conflict somewhat with the sixth point in trying to understand why this happens and attempting to address the problem. Points 4 & 5 suggest that the reporter’s primary objective is financial gain, and coupled with 1–3 that they recently found out about this issue (or issues like it) and saw an opportunity to make a quick buck off large organizations with mediocre security skills. This would lead me to believe that the rashes of back-to-back reports are prompted by, perhaps, media coverage of bug bounties or reporting of a new-and-interesting configuration error in large numbers of sites. Unfortunately, the error or flaw being reported is often not new or interesting. I believe that the sixth point is most instructive, and I think there’s something the community can do about it. I suspect that these rashes of reports are in fact course assignments for some sort of course on computer security being taught at an academic institution (and probably various courses at various institutions). I suspect that students are instructed to learn about some common vulnerabilities, find an example on the web, and contact the site administrators with their findings. I cannot object to the general principle behind such an assignment. However, I can object to the way it is being specifically handled. If my suspicions are correct, then I believe that it is the responsibility of the course instructor to vet the students’ individual reports for relevance and correctness before sending them on to the affected organizations. I would also leave out the bounty-seeking in an educational setting, but I recognize that requesting a bounty for valid flaws is an accepted practice in the commercial world, and that identifying valid flaws is a valuable service. An alternate, but related, possibility is that some security course is discussing vulnerabilities and disclosures, and students are taking it upon themselves to contact various organizations with flaws they found using automated tools to try to make some cash on the side. I find this less likely given the very short time frames in which such reporting bursts occur (often just a few days). In either of these education-related cases, there’s something that can be done about the problem. If you are an instructor teaching such a course, please emphasize responsible reporting, which includes understanding both the mechanism and the impact of the flaw, and determining whether it is likely to be relevant to the affected organization. In addition, as mentioned above, screening reports before they are sent out would be the neighborly thing to do. In the case of an organization like Pidgin, we take vulnerability reports seriously and expend some effort validating their existence and/or relevance. As we are an all-volunteer organization with a limited amount of time at our disposal, dealing with bogus and junk reports waste valuable resources. Report responsibly! With a great help from LRN, who sent initial set of patches for fixing autotools-based build for win32 and assisted in the work, I have finally managed to make 3.0.0 cross compilation possible and easy. It also involved fixing minor win32 problems and enabling features that were not accessible for this platform before. The most important change is making linux-to-windows cross-compilation almost as easy as normal build. The whole effort (not counting installation of mingw* packages) is reduced to setting two environmental variables (PKG_CONFIG and PKG_CONFIG_PATH) and adding a single switch to the configure script: ./configure --host=i686-w64-mingw32 && make. That’s all! For now, there is no option to cross-build the installer yet. On the other hand, the most end-user-attractive change is a Finch win32 build. It required both libgnt and Finch fixes, which made those two quite usable on this system. Moreover, I finally implemented all remaining features required for using OTR plugin with Finch. There is still one missing – you cannot browse key list yet, but it’s not crucial for a daily use. This change is not related to Windows and there may be minor problems when running the new OTR plugin on win32, but I will face all of them by the chance of integrating it with Pidgin tree. An example of less significant, but still useful Windows related change is GTK3/gstreamer-1.0 compatibility, which was an easy to achieve with the fixed autotools build. 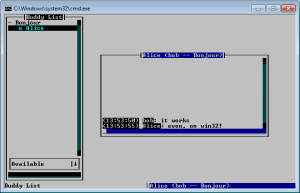 I also removed the Bonjour SDK dependency from the win32 build, as there were license issues with it – for now, you can build Bonjour prpl without it. The last feature may be found useless by some of you, while some might like it – that’s why it’s optional. You can enable Filesystem Hierarchy Standard directory structure with a single configure switch: --with-win32-dirs=fhs. For now, it’s the easiest way to prepare a working Windows build, since there is no cross-built installer yet. Pidgin 3 is not API/ABI compatible with Pidgin 2, and is only partially configuration-compatible. While the first incompatibility is necessary to move forward, the second might be really frustrating for users. Because of ABI incompatibility, libpurple2 plugins won’t work with libpurple3 – their authors will eventually convert them for the new version. Configuration incompatibility may lead to loosing your data – preferences, contacts etc. Pidgin 3 was almost backward-compatible, which allowed to switch to it flawlessly. On the other hand, Pidgin 2 was not forward-compatible. For example, it dropped all encrypted passwords, that were set with Pidgin 3. Now, it won’t be able to read those (since keyring support is not implemented for 2.x.y branch), but at least it leaves them in place. 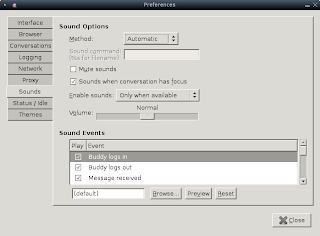 I also fixed more forward-incompatibilities: handling for GTalk and Facebook XMPP accounts created with 3.0.0 version and internationalization issues related to default group (“Buddies”) naming. All of these will be released in 2.x.y branch, so you will be able to switch from 3.0.0 to 2.10.10 and back without loosing your data. There were also minor, but annoying issues fixed. 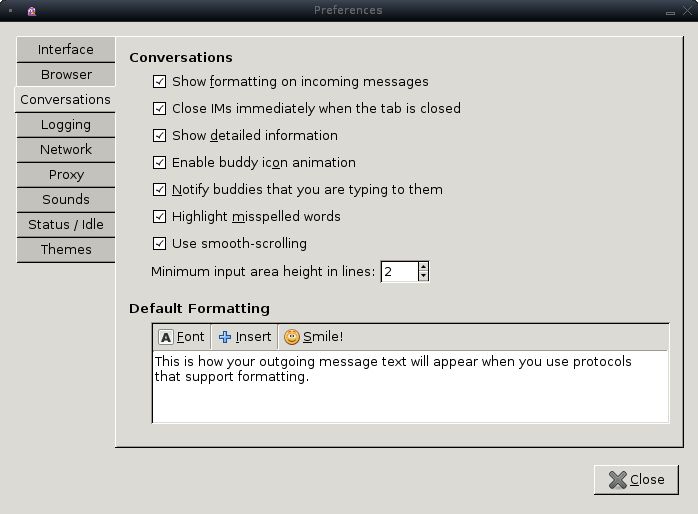 Nick colors for chat participants in XMPP MUC or irc should not suffer from a low-contrast issue. I have finally made spell checking usable, by implementing a language selection sub menu for WebKitGTK. It still has some flaws, that I will work on some day: the biggest one is that the selected language is global, not per-conversation. To make development branch more stable, I decided to focus on Coverity bug reports. Since we are allowed to maintain just one branch at once, I decided to fix all 2.x.y reports before switching to 3.0.0. For now, I fixed almost all of them (and merged fixes to the 3.0.0 branch), so it should be a bit more stable. I also updated all win32 dependencies, which should also improve stability. Don’t get me wrong, there is still a long way to the stable Pidgin 3.0.0. But it’s already usable right now. 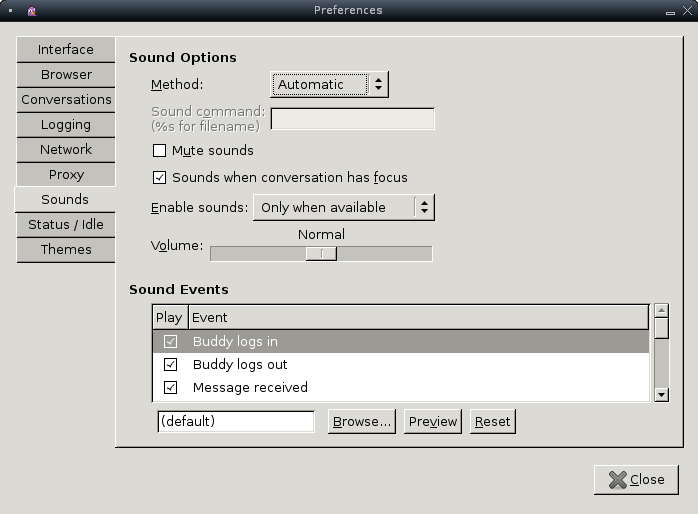 I have switched from Konnekt (a local Polish instant messenger) to Pidgin around the year 2007. It provided a feature absent in Pidgin, that I missed very much: an easy way to send screenshots. There were a plugin for Pidgin 2.x.y, but I didn’t liked it and it wasn’t working with Pidgin 3. Ultimately, I decided to invest two days of my life and create my own plugin. It just works, covering all attributes I liked in other instant messengers with such feature. It’s simple, stable and fits into the Pidgin UI well. I plan to extend its functionality with another plugin. For now, it’s only possible to send screenshots over protocols with inline images support. Thus, you can not use it with XMPP or IRC. The second plugin will allow for uploading images to imgur (or similar services) for protocols that doesn’t support images. I have put a lot of effort into a feature that I don’t even use: graphical emoticons. As usual, the small issue resulted in a large code refactoring. I had the task of fixing regression bugs from Pidgin 2.x.y, so I took care of broken remote smileys. It’s a pleasant feature, that allows defining the list of custom smileys to use in outgoing messages. If we send one in our message and the remote client doesn’t have it, the image will be automatically transferred. For protocols not supporting this feature, the bare textual representation will be shown instead of the picture. The code responsible for emoticon handling was horrid. In 2.x.y branch it was already quite messy, but became even worse after replacing GtkIMHtml with WebKitGTK for displaying a conversation. The problem was, the old parsing code was optimised to be used with GtkIMHtml. It was totally incompatible with WebKitGTK, so the GSoC student who did a conversion made his own provisional smiley parser. It just added insult to injury. Both GtkIMHtml and WebKitGTK use purple’s “stored images” to provide data for emoticon smiley. It’s a generic container to hold raw image file contents, without any decoding. Its main purpose was pretty simple: to reference this data by a single integer number. Thus, an image may be embedded in HTML with <img src="purple-image:5">. It’s quite convenient, but the API was a bit messy. Not that bad, but we had plans to convert it to a GObject. Instead of duplicating the exact behavior of the old implementation, I took the usual way: I wrote entirely new PurpleImage class, much richer, but also simpler to use. PurpleImages, aside from the old simple referencing feature, have several new ones. Remote images support is the one which improves end-user experience the most. It allows defining an empty image and providing a data for it later. Now, if we receive a message with an inline image embedded (not necessarily a smiley), it will be displayed without it and the image will be shown when ready – just like its done in web browsers. It heavily impacts protocol plugins: with the old API, they had to queue messages and wait for images being transferred. Now, it’s fully handled by libpurple. By the chance of deploying it, I fixed inline images support in every protocol that had it. As I mentioned before, the smiley parser for 3.0.0 branch was provisional and the old one was not suitable for WebKitGTK. GtkIMHtml (a Pidgin 2.x.y component, despite its Gtk namespace) exposed its internal parsing mechanism and allowed to process every literal in parsed HTML. Thereby, a libpurple routine was called on every word and replaced them into an image, if hit the emoticon. The lookup was quite fast, because of trie-like implementation of GtkSmileyTree. 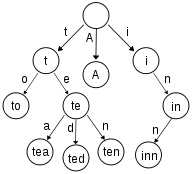 A Trie is a tree structure for holding multiple strings and searching them by prefixes. The primary idea of trie is that two strings with the common prefix will share the part of tree for the common segment and branch out the remaining parts. It’s only a fundamental part of structure, which may be used for completely different purposes. In fact, it was used both in the old GtkSmileyTree and my new smiley parser implementation. Except for this single similarity, these two are barely related. Instead of writing fat-but-fast smiley parser, I decided to implement independent PurpleTrie class – a trie-based text search algorithm. It allows for searching multiple strings in multiple source texts in a linear time! To be precise, it needs O(m) time for building a trie (where m is the total length of provided patterns) and O(n) time for searching (where n is the length of source text). The frequency of patterns in a text doesn’t affect this value. The best thing in that structure is, it may also be used in libpurple plugins. For a contrast, the interim smiley parser implementation was not focused on performance at all. Its search time could be estimated as O(n * m * t), where n is the number of smileys, m is their length (assuming smileys are equal-length – in the real-world case the formula would be more complicated) and t is the text length. It’s that bad, mainly because every supported (not necessarily inserted into a text) smiley is parsed separately. The m * t part depends on strstr implementation, but for the better ones we could find another similarly bad instance of smileys configuration. With such bad complexity, it could even be exploited for a denial-of-service attack. In 3.0.0 branch there were a lot of smiley- and image-related issues and I haven’t described all of them. But I hope I fixed all of them. You can look for details in our hg, in smiley-related commits between 302a7cb4c1ab and d598e7950c34. Now, I am focused on the permanent issue – the Windows version. As recent news events have driven home time after time, secure communications is a difficult yet important aspect of modern life. What “secure” may mean differs from person to person and from topic to topic, but certainly the typical person is somewhat uncomfortable with the idea that anyone — and in particular, large corporations or the government — might be eavesdropping on their casual communications. There are exceptions, and there are people who believe that only criminals should have something to hide, but for the moment let's assume that some measure of secrecy in private communications is warranted and/or desirable. This post is a commentary on some of the technologies that make it possible (or difficult or impossible, in many cases) to achieve secure communications on an instant messaging (IM) network. I'm going to play a little bit fast and loose with terminology to help keep it understandable, but I also want it to be accurate. In particular, when I say that communication is secure, I mean private, specifically. For the purposes of this post, that effectively means encrypted and using some sort of authentication protocol to ensure that it's encrypted to the right person. The details are out of scope. Please contact me if you notice any particular discrepancies or incorrect statements, either arising from loose terminology or other errors. First, where I'm coming from: I believe that essentially all communications should be secured, and I believe that that security should be very strong. By “very strong,“ I mean that it should be effectively impossible for any third party to eavesdrop without the acquiescence of a party participating in the communication. I have a fair amount of history in computer communications. I am a long time developer on the Pidgin instant messaging client and related software. I am on the board of directors for Instant Messaging Freedom, Inc., a non-profit organization “whose goal is to support free instant messaging software.” Instant messaging is important to me as a communication technology filling the gap between real-time spoken communication and e-mail. A secure connection to the server protects your connection from eavesdropping on the local network and the path between you and your IM service (provided that it's done correctly), but it does not protect your conversation from the IM service itself and it does not tell you anything about whether the user you're chatting with is using a secure connection. Despite these weaknesses, a secure connection to the server is critically important, because it protects a large amount of private information. Things like buddy lists, status updates (online, offline, away, etc.) from your buddies, and your own status updates pass through this connection and are not necessarily targeted to any specific other user, which makes end-to-end encryption difficult. End-to-end security protects your communication from eavesdropping all the way to the other user. If some person or organization wants to read your messages, they have to do so at your computer or your interlocutor's computer. There are a small number of protocols that support this directly, but mostly not in a particularly useful way (see the discussion of AIM encrypted IM above). Given the individual limitations of these two forms of data security, we arrive at the inescapable conclusion that, for instant messaging services, they are complementary rather than redundant or simply unrelated. Secure connections to the servers provide best-effort protection for group chats, administrative information, and metadata, while end-to-end security provides strong protection for conversation content. Traditional IM networks are monolithic, walled gardens — if you want to chat with a user on the network, you get an account with the single service provider for that network. There have been limited exceptions to this over the years (e.g., MSN Live Messenger and Yahoo! Messenger offer(ed) some degree of interoperability), but for the most part, not only have networks been incompatible, there have been sole providers within those networks. This kind of structure means that, while your metadata and administrative information are only ever managed by a single entity (the monolithic service provider), that service provider also sees all of the related metadata etc., and it's necessary some giant faceless corporation. That corporation stores your buddy lists, knows when you talk with whom, knows when you're away or idle, and all kinds of other behavioral information. Moreover, it has you in a lock — if you want to talk to your buddies, you have to use its services. The alternative to the monolithic single-provider network is a federated service. In a federated service, multiple (possibly unrelated) service providers cooperate in a network tied together by a common protocol, allowing users of different service providers to interact with each other without worrying about whose service is provided by whom. In a federated structure, you still have to trust your service provider with all of your metadata and administrative information, but you don't necessarily have to trust any of the other service providers in the network. In fact, in the general case, most of them don't even know you exist! Some portion of your data will necessarily be shared with the servers your friends and interlocutors are associated with, but you can scope that sharing to a greater or lesser degree. On the other side of the coin, you also have to place at least a small amount of trust in third-party providers with whom you have no specific relationship, if you want to talk to people on those providers' servers. 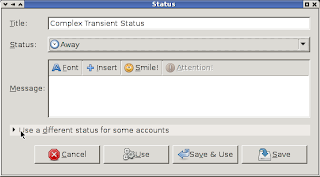 The quintessential federated network is XMPP, previously known as Jabber. XMPP is a widely federated network, wherein anyone can run an IM server and become a service provider for other users. Conversations between users work a lot like email; if I want to chat with you, I send a message to my server, it forwards it to your server, which forwards it to you. The return path is the same in reverse. Not only can anyone put up an XMPP server, but the protocol is entirely open and well-documented, so there are literally dozens of server software implementations and thousands of providers already in the network. Those providers range from large, commercial entities (such as Google's Google Talk, now known as Hangouts) to tiny servers serving just one user. The huge benefit of federation is the freedom to choose your service provider. Moreover, to change that service provider. With an open federated network like XMPP, you can even be your own service provider if you so desire. That's a kind of communications freedom that no monolithic provider can ever provide, by definition. It is my opinion that the federated structure is a superior solution, security, privacy, and freedom-wise, to old-style monolithic IM networks. The majority of your sensitive data (administrative information, complete buddy list, etc.) is kept and managed by only one entity, and is parceled out to third-party entities only as required to provide the services you specifically request. In the specific case of a closed group of users (such as a corporate or organizational server), it may be contained entirely. I am also a strong advocate of open standards which federated solutions tend to require (to make federation possible), and which XMPP certainly provides. The ability to pick up your data and move it to another service provider with limited (or nonexistent) loss of functionality is an extremely powerful argument for the freedom of a federated solution. The foregoing basically points to a simple best practices recommendation for IM freedom and security: use XMPP, find a server you trust, ensure that you're using TLS encryption, and employ an end-to-end security solution like OTR when it matters. (Unfortunately, without complete penetration of end-to-end security solutions, “when it matters” is the best we can do. Even then it can be hard to achieve!) Today, with the availability of a number of large XMPP service providers with federation and open registration (Google, DuckDuckGo, Jabber.org, or dozens of others), as well as many fine XMPP clients (including, of course Pidgin, finch, and Adium), getting an XMPP account and finding your friends is relatively painless. Many of them will already be available if you simply add gmail address as a buddy in your XMPP client. Secure connections are not yet provided by all XMPP servers. Among servers that do provide secure connections to clients, not all provide secure connections to other servers. (If you recall the email-like communication model of XMPP, this means that your communicatiosn with users on other servers would not be secured between servers, even assuming you trust both servers.) The excellent xmpp.net directory of public XMPP servers provides ratings for client-to-server and server-to-server communications security; look for A-rated servers. If you set up your own server, xmpp.net also provides a security validator that can be used to ensure your personal server is up to snuff. Going forward, there are a number of efforts underway to further improve the already rather good connection security situation in the XMPP network. Notably, the XMPP manifesto is (documentation of) an effort to transition the entire federated XMPP network to secured connections by May 19, 2014. The end-to-end security situation is still a little underdeveloped, in my opinion. OTR is great, but its protocol-independent nature leaves it with a level of integration that isn't as complete as it could be. I have some early-draft notes on desirable features for a new XMPP end-to-end encryption protocol, but a lot of work remains to be done on the topic — and much of it by people with stronger crypto chops than I have. The takeaway from all of this? Ditch your AIM, MSN Live Messenger, Yahoo! Messenger, or whatever other IM services you're currently using, and get on board with a federated XMPP provider. Follow the recommendations in best practices, above. Use a public server or install your own, but do it sooner rather than later. Make sure you're using TLS (or SSL, if you have to) to protect your connections, and consider installing OTR. Then, when you're done with that, start bringing your friends over. Talk to them about the benefits of freedom in IM services, describe the insecurity of communication on traditional commercial IM services, simply tell them you're not dealing with a closed IM service any more, or whatever. Point them at this article, if you think it will help. XMPP already has critical mass, it's simply a matter of expanding the borders. If you have the necessary background, consider contacting me about working on an integrated end-to-end encryption and authentication solution for XMPP. Join the devel@conference.pidgin.im XMPP MUC and indicate your interest. SILC is an example of a service that provides native secure connections and native end-to-end encryption. Unfortunately, it is no longer a maintained codebase, it is not well-supported by IM clients (though libpurple, and thus Pidgin does support it), and it has a problematic federation model. “Cannot“ is a bit strong here, but I believe that, given the current state of the art of encryption protocols and mechanisms, it's true enough to use for the moment. Secure multiparty broadcasts with hundreds of recipients would be very expensive using standard techniques. The literature may (and probably will) have some answers to this problem in the future, but for now, I'll say cannot. I say typically here because I know of no non-local-network service that handles this any other way. Local network messaging (like Apple's Bonjour) has other solutions to this problem. Generally, however, you send your status updates to the server and it distributes them (possibly by way of other servers, in a federated protocol) to interested parties on your behalf. Modern instant messengers claims about security and privacy. And users trusts them. But companies that delivers such services sometimes fails protecting their users privacy. The point is, that user doesn’t have any control over confidentiality of his private conversations – the service provider does it. In most cases, this schema works pretty good: user A sends a private message via an encrypted connection to a service provider and the provider sends it to the user B (also using an encrypted connection). The problem occurs, when the intermediary company reveals such message – due to software failure or dishonest employee. Encrypting the message by A seems to be the solution, but it creates another set of problems. To make user A able to encrypt a message for user B, he have to obtain a B’s public key. But how to obtain it in a secure way? What, if B loose his key, used to secure a long history of conversations? Also, to make user B sure, that the A sent the message, user A have to sign it. But what, if user A says something humiliating to user B in private, but the second one reveals the message to the public and use it against A? The message is signed by A, so there is a proof he wrote it. perfect forward secrecy – if someone get your private keys, he won’t be able to decrypt any past conversations. There is a plugin for Pidgin, implementing OTR messaging – pidgin-otr. Unfortunately, the user have to install it by himself, so it’s not as easy to use as in other messengers. I was asked to integrate it within the official release. I decided to make this task a bit more challenging. 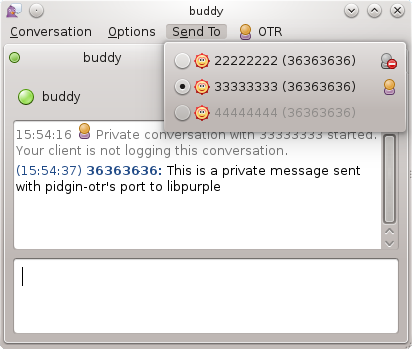 Pidgin-otr is a Pidgin UI client plugin, so it’s not available for other libpurple clients. Some of them (Adium) implements OTR by itself, some (Finch) doesn’t offer such functionality. I decided to rewrite it as a pure libpurple plugin, to provide this excellent feature for all clients that use libpurple as a backend. Fortunately, pidgin-otr is pretty well designed, so I had only to alter things related directly to the UI. End-to-End encryption providers API allows to present (implementation independently) conversation’s security state. Previously, pidgin-otr and similiar plugins placed their own controls in various parts of the conversation window, now it’s standardized. Request API refactored with PurpleRequestCommonParameters, which makes this API easily extendable. 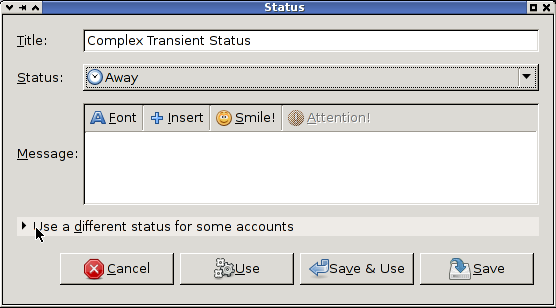 Using PurpleRequestCommonParameters for new features implementation, like an option to provide HTML decorated text descriptions, an option to alter the dialog icon, to make better control over the dialog buttons. Adding a new window type: cancellable “please wait” dialog, with an optional progress bar. These changes may not look crucial. In fact, without them the libpurple’s pidgin-otr port would look really poor or even awkward. At this point, all conversation-related code is ready and working fine, and it’s possible to use it conveniently. I haven’t implemented configuration dialogs yet (It’s the next task for me) nor adapted Finch for the new API (so it’s not possible yet to use it with OTR, but it’s not the hard part). Unfortunately, there is no possibility to test it at the moment. The libpurple’s part is in its repository, but the new pidgin-otr is developed in its non-public branch in OTR authors repo. Nearly a year ago, I’ve decided to put some effort here and implement new, flexible HTTP API. Now, I’ve came even deeper, replacing existing implementations with my new tool. Replacing old HTTP API with the new one consisted of few stages. Firstly, I’ve replaced all purple_util_fetch_url occurrences with purple_http_get. That was the pretty easy step, because both functions does roughly the same thing: gets the URL and returns its contents. Then, it was the time for the tricky part: purple_util_fetch_url_request required building and parsing HTTP headers manually. Also, it leaves part of proxy handling on the caller in a weird way – he have to pass an full URL in request header, if proxy is on, or short (without hostname) otherwise. yahoo protocol plugin was the record-holder with the value of four distinct HTTP implementations; I think, only in case of yahoo file transfers it wouldn’t be possible to do it using existing API. There are still two remaining, but I’m not sure if I will refactor them at all. The first one is for Gadu-Gadu protocol – it’s included in libgadu library, so it’s not trivial to pull it out without violating its API. The second is for Novell GroupWise Instant Messenger – a closed service, available for companies. There are no public test servers, which I could try out. Also installation and configuration of its demo overwhelmed me (in fact, it’s buggy). I’m not sure if it’s worth the effort to do both cases above. My next task will be Off-the-record plugin refinement and integration into the main tree. I just did another long desired feature: Video conferences support for Windows. There already were attempts to do it, but they were not finished nor even published – this one is already in Pidgin’s tree, so it’s a matter of time to get them released (just wait for 3.0.0). If you don’t want to wait, you can always grab a development build. I did a lot of tweaks both in Pidgin and its dependencies (GStreamer and related), but finally everything looks working and stable. The hard part, unlike in the previous Eion’s attempt, was the camera capture plugins for GStreamer – DirectShow and WinKS. The first one is not buildable in newer gst-plugins-bad releases (at least, for mingw), the second is buggy. I’ve chosen to work with WinKS: the main problem was, it had broken support for different capture resolutions (I guess, old cameras had no support for it, so they were not affected). Many hours of debugging resulted in a simple patch, that makes the resolution fixed. The other one existed in Pidgin itself: there were no possibility to select camera, because winks used different method of device enumeration, than Pidgin supported. On the occasion of testing VV on Windows, I’ve came up with a simple idea: some users may do not want to show their faces in video conferences, but they could want to see others. So, I implemented a new, virtual device (both for Linux and Windows): Disabled. Depending on user’s choice, it displays black screen or random noise, like on TV. Simple, but useful. Testing on Windows platform showed some bugs, that were hardly noticeable before: hangs on video testing, displaying a video output in a separate window. Beyond them, I also fixed some memleaks and did other tiny fixes. The source code is available directly from the hg repository and openSUSE Build Service project (for dependencies). If you just want to test the VV feature on Windows, you can just grab the offline installer. As always, I’m waiting for any feedback, bug reports and comments. Ankit Vani will be working on GObjectification. This entails a lot of behind-the-scenes changes to the Pidgin code to use GObjects to make developer’s lives easier. Ashish Gupta will be working on improving file transfer between libpurple and non-libpurple IM clients. He’ll initially be focusing on the Yahoo! and XMPP protocols before moving on to a protocol-agnostic file transfer plugin. Bhaskar Kandiyal will be creating a website for browsing available Pidgin plugins, as well as improving Pidgin’s plugin management and installation UI. 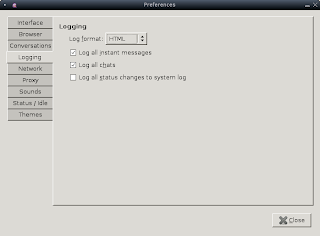 Phil Hannent will create Quail – a Qt GUI for libpurple. We’re looking forward to seeing what they create! The coding period begins June 17 and ends September 23. As always, thanks to everyone who applied. And remember, this is an open source project and you’re welcome to contribute even if you’re not participating in Summer of Code. The Pidgin’s master password branch, which engaged me for the last two months is now ready to show to the public eye. Moreover, it depended on the other security-related task: taking care of Windows build – this one is also mostly done now. Today, I would like to present the current results of my work. When I was just before start of work on master password branch, it was described as almost ready to merge, or even ready. In fact, it worked fine only for a small part of cases, where user sets up everything correctly and never mistakes while typing in a password for the configured keyring. The funny thing is, that the feature mentioned in the name of the branch, was never implemented (storing passwords internally, encrypted with a master password). I must admit, that some part of the work done by GSoC’08 student was fine. I would say, it was a good proof-of-concept implementation. I just done the final one and made it close to be ready to ship. Handling all possible use cases (not only the ideal one) required almost twice more code than produced during SoC, also the small part of the code was left as-is (because of its good enough quality). The chart below presents some estimations about it, made only on newly added source files (keyring.c and specific keyring implementations). Doing things right required also a lot of fixes in the main development branch: ciphers reworking, fixing win32 build (there is also a special keyring for this OS), fixing UI components like request API and some minor 3.0.0 bugs. Some of them wasn’t too absorbing (preparing ciphers API for my needs taken just few days), and some were big enough to entitle them as separate task (win32 build taken about 1/4 of the total time spent). The 3.0.0 win32 build was broken for a year or two, so I had to fix it to be able to implement a keyring for this OS. Although, it was a separate security issue, because runtime dependencies, shipped with Windows version of Pidgin, were collected from sources that weren’t eager to update them. I have managed to switch almost all win32 dependencies to pretty reliable openSUSE Build Service. I guess, some of them (like these related to WebKitGTK) would be hard to obtain from elsewhere than OBS. This service proved high responsibility for their releases, by fixing security issues in few hours after my requests (updating some libraries or applying patches with security fixes). Non security issues also were fixed in reasonable time. I would make a special thanks to Fridrich Strba, who assisted me with preparing OBS repository for Pidgin’s needs. Without his help, doing a pretty stable 3.0.0 build would be twice as hard. Keyring is a safe, which holds passwords for accounts configured in Pidgin (or other libpurple client). There are few of them implemented, so the user may choose the one, which best fits his needs. If none of them are suitable, he could provide his own implementation. Internal keyring in cleartext mode provides backward compatibility, where passwords are stored without any encryption, just as-is. This doesn’t need to be insecure, as long as the access to accounts.xml file is restricted. Internal keyring in master password mode also stores them in accounts.xml file, but encrypted. The encryption key is derived from a master password, which have to be entered once per every client startup. GNOME Keyring and KWallet moves this responsibility to a service started by operating system. Passwords are stored here encrypted using a master password, entered once (depending on configuration) per OS startup. Secret Service (implemented by libsecret) is another OS keyring. Unfortunately, its plugin serves a lot of issues at the moment, so it’s not enabled yet. Windows credential manager encrypts passwords using Windows user account data. Its security depends on system configuration – encryption does nothing, if user’s account isn’t even protected with password. KeePass is a cross-platform keyring, which could be a good choice for people using the same Pidgin configuration files for multiple operating systems. Unfortunately, it doesn’t seems that KeePass could work with Pidgin out-of-the-box – it requires installing a plugin for KeePass to operate with various applications. At this moment, there is no implementation for it. Password encryption implementation for internal keyring is really sensitive spot, so it had to be done very carefully. It’s important not to try doing own, fancy schemes, but to use approved methods. Even then, it’s really easy to screw things up. Choosing a good blocks to build this feature is crucial, but if they turn out, to be weak, there have to be an option to change them. So, I made a possibility to choose encryption method, but I’ve implemented only one for now. I have chosen two algorithms: AES-256 for encryption and PBKDF2-SHA256 for deriving a key from the master password. PBKDF2 algorithm have configurable amount of iterations (default is 10000), so user may to raise it, if he needs paranoid level of security, or decrease (but not below 1000) if his machine is too slow for the default value. ciphertext is base64 encoded, so it’s possible to store it in xml file. IV is a random, 128bit vector, which makes every ciphertext different, even for the equal plaintexts. It’s stored with the AES output, to make it easier to maintain. 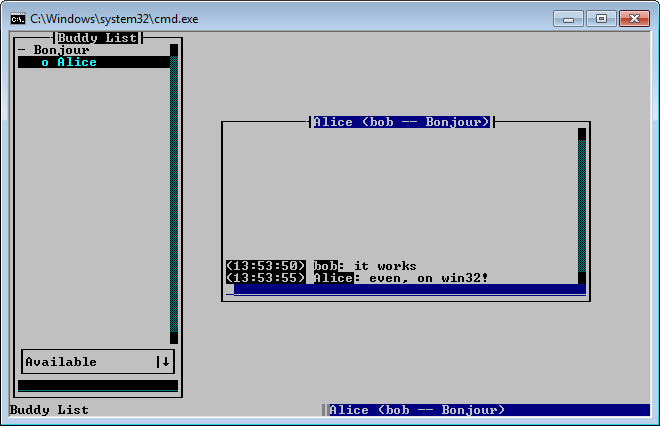 AES is used with 256bit keys in CBC mode. plaintext is stored without NUL terminator – its length is determined by one of the paddings, depending of its length. min length padding extends plaintext length to be not shorter than 50 characters, by appending NUL bytes to its end. This hides an information about a password being short or long. control string is a constant string – allows verifying, if decryption was successful. pkcs7 padding determines the length of the [plaintext] ++ [min length padding] ++ [control string] sequence. I’m waiting for any feedback, bug reports and comments. I would also appreciate any linguistic corrections – you may review all of them by searching in pidgin.pot file for /keyring.c and /keyrings/ phrases. Students: Apply to Pidgin Google Summer of Code now! The application period for applying to Google Summer of Code opened on Monday and we’ve already received a number of applications. The application period closes next Friday, May 3rd. Just 8 days left—don’t wait, submit your application soon! Google has accepted Pidgin into Google Summer of Code 2013. Woo-hoo! We’re looking forward to mentoring a few lucky students again this year. For more information, read Google’s announcement, peruse our application template, and see our list of project ideas. The application period beings April 22nd—just two short weeks away! We always encourage our users to brainstorm and share your ideas on improvements you would like to see in Pidgin, Finch, and libpurple. Feel free to share thoughts and ask questions on our devel mailing list. Some time ago, Google contacted me regarding security concerns related to Pidgin. After a long discussion, they decided to make a donation to Instant Messaging Freedom foundation, which was then able to sponsor some work related to Pidgin’s security improvements. Therefore, I will periodically publish here news about work being done (of course, containing only the non-sensitive information). The first task I took care of, was finishing and migrating master password branch. It was a Google Summer of Code project in 2008, but wasn’t finished. When I started working on this, it was pretty unstable, but now it’s slowly becoming polished and useable. Master password branch provides Keyring support, which solves one of the most complained security issues about Pidgin – storing all passwords in plaintext. There will be an option to store passwords in system-provided safe (like GNOME Keyring, KWallet, or using Windows credentials to encrypt them) or still using the old, plaintext method. Supported keyrings are implemented as plugins, so every interested developer can provide his own method of storing such sensitive data. There will be even an option, to encrypt all passwords with one master password, supplied by user. Development version of Pidgin with Keyring support can be obtained directly from its repository. Any comments, code reviews or tests would be appreciated. I’ve just shared a page containing Pidgin development builds with GG11 support. Probably, we’ll have to wait for official release a little more, so I’ve prepared it to make testing of new features (described on this blog) easier. Package is installed similarly, as official Pidgin from sources – the only difference is necessity of having auto-tools installed. Moreover, we need to keep in mind, that 3.0.0 branch have different dependencies, than 2.x.y. Unfortunately, Windows version is not available at this moment. If there will be anyone interested, I will update these packages in case of interesting new functions or fixes. Please leave some feedback and inform me about potential issues related to Gadu-Gadu protocol plugin. So, Microsoft recently announced that they’ll terminate the Windows Live Messenger service in favor of Skype in early 2013. We’ve been getting a number of questions about what this means for Pidgin. Quite honestly, we don’t know. At this point, all we know is that China will still be able to use Windows Live Messenger. That leads us to believe that the servers providing MSNP service will remain active and maintained for some period of time after the announced shutdown, but it’s not clear whether or not that will be the case. It’s also not clear if the servers supporting China’s continued use of WLM will be accessible to non-Chinese IP space. Even further, it’s not clear if the recently-launched XMPP interface to the WLM network will remain functional. We don’t support that yet though, as it requires some authentication magic we don’t implement. Even if we implement support for the authentication this XMPP gateway requires, it could end up being a waste of time, as it could get shut down at any time, either before or after the rest of WLM. And before anyone goes there, we can’t support Skype. There is no documentation of the protocol available to us, nor is there code we can borrow from a cleanly reverse-engineered alternative implementation. All that exists is SkypeKit, whose license agreement explicitly forbids its use in open-source software. The license also forbids use in “server applications” which precludes doing something like wrapping a simple closed-source XMPP daemon around SkypeKit. It is not currently possible to legally support Skype, so we won’t try. The bottom line is we have no idea what the announcement means for Pidgin or any other alternative clients yet. We’ll all just have to wait and see. I’ve just managed to create a fully working implementation of new file transfer method in GG11. That means, Pidgin is the first alternative IM with support for it. This also means, I’ve managed to fulfill the most expected promise from this year’s GSoC. The new method is way more reliable, because it uses Gadu-Gadu servers for file transfers and is built using the HTTP protocol. Thus, there are no more issues related to externally (in)visible ports for people behind firewall or NAT. GG servers also takes care of legacy clients, so there is no need for implementing the old protocol. Files are sent via the GG Drive service in this way (schematically): sender puts “ticket” on GG Drive – proposal for a file transfer. After the recipient’s acceptance, we can send the file to the GG server – when it’s completely transmitted, the other party can download it. All operations are made through HTTP protocol, so it should work even using proxy servers. To be able to enjoy this new functionality, download development versions of Pidgin and libgadu from applicable repositories and compile by hand. Unfortunately, we have to wait for a final version to be released for reasons beyond my control: releasing libgadu with GG11 support and Pidgin 3. Side note: GG file transfer support is one of the oldest tickets for Pidgin: #372. I have just finished new http support module for libpurple. Old one was a bit poor, so it didn’t allowed well-designed file transfer implementation for Gadu-Gadu. So, I decided to put here some more work and do it well. Before making a decision about own HTTP support, we (with Pidgin dev team) were trying to choose any library, which can do it for us. I had succeeded with initial libcurl integration, but it turned out, that it’s not possible to force this library to use all required libpurple callbacks. Such library have to use Pidgin’s proxy, ssl and dns implementation. Other libraries case is – unfortunately – much worse. All obstacles before introducing file transfer support for GG are suppressed, so I can handle this now. Furthermore, I had succeeded with test implementation of sending a file – it’s unusable rigth now, but at least – it works. Announcing our four Summer of Code students! We’re pleased to announce that we’ve accepted four students for this year’s Summer of Code! It’s always difficult to narrow down so many great applications into just a handful, and we want to thank everyone who applied. The coding period runs from May 21 through August 24. If you want to follow the progress of the four students, they’ll be providing periodic status updates to our devel mailing list throughout the summer. Read Google’s official announcement here. Libpurple was accepted in the Google Summer of Code this year 2012. I urge every student reading this to apply for any of the projects accepted and if you like, apply to Libpurple. We have a set of proposed ideas but you are encouraged to bring your own ideas since they will be fresher and will not compete with other people over the same project. You can find libpurple's application page at Pidgin, Finch and libpurple. Pidgin Accepted to 2012 Summer of Code! Good news, everyone! Google has accepted the Pidgin project‘s application to be a mentoring organization in this year’s Google Summer of Code. If you love programming and are looking for a chance to help an open source project, look no further. Get inspired by our ideas list. But don’t limit yourself to those ideas—we love when students propose their own projects. We’re guessing we’ll request slots for 3 students this year. I wrote a crummy tool that displays the current DNS SRV records for a given XMPP domain. After writing it I discovered that Olark has already created something similar. My tool attempts to do some really basic sanity checks and warns if it sees problems. If you think of something that it should check for but currently does not, please let me know! And please let me know if you notice any problems or have other suggestions. Pidgin/Finch/libpurple/Instant Messaging Freedom, Inc. didn’t apply to be an organization in Google’s Summer of Code (GSoC) this year. Why not? The short answer is that I didn’t feel we had enough developers willing to mentor students for it to be worthwhile. The long answer is a little more complicated. I feel very lucky that Pidgin has been able to participate in GSoC for the previous 6 years. GSoC is an amazing program and it gives me a warm feeling that Google has consistently funded it, and I hope they continue long into the future. I think I’m a better person for having mentored some students and for having been our organization administrator a few years. Pidgin has certainly benefited. Heck, Finch itself was a GSoC student project. And the developer went on to be an integral part of our development team. Other benefits: Our UPnP implementation for peer to peer connections. SIP/SIMPLE/STUN. A D-Bus interface. Performance improvements. MSN, ICQ and Yahoo! maintenance. The MySpace protocol plugin. Our certificate manager. But mentoring students does take time. Five hours per week per student is a reasonable approximation. Some students need less guidance. Some students are so productive they need more help, having their code reviewed, getting feedback on implementation ideas, etc. Reading through and ranking all the student applications takes time. There’s also a mid-term and final evaluation survey that must be filled out. The time required for all this isn’t particularly unreasonable, but many of us developers have very little time to start with. I tried to get a verbal commitment from some developers this year on whether they’d be able to mentor and the response was pretty limited. In general people expect to be pretty busy this year, and it didn’t seem appropriate for us to commit to GSoC when we may not be able to give our students the level of attention they deserve. And so it is with a sad heart that I decided not to submit our application this year. It seems likely we’ll apply again in 2012. Also, please don’t get the idea that we don’t want contributions—we love patches and new contributors! Last weekend was the GSoC Mentors Summit. As a mentor for the Pidgin, Finch and libpurple project, I attended for the first time this year. It was pretty interesting and a lot of fun, but I have to say I didn't really feel like much of a geek there! Everyone's either got an iPhone or a Droid, and they've all done awesome stuff. Can you say you've worked on WordPress, used by millions of websites, or Apache, serving even more websites, or RTEMS, running several space exploration instruments and other consumer products, or who knows what else? Nevertheless, it wasn't like I was totally unknown. There were quite a few people who use Pidgin, even one or two using Finch. Oh, and some Mac users using Adium (using libpurple), too. The flight was fine, but the weather was a bit disappointed. It would have been nicer to explore a bit more, but at least I got to eat a ton of chocolate. I'll try and write a longer re-cap later. I have just pushed the revision that merges my MSNP16 and SLP branches to the main development branch in pidgin. I'm very happy to have this branches merged since they represent almost all the code I have been writing on the last year. Yes I have started coding MSNP16 support almost a year ago and it took a lot of effort, reverse engineering, debugging Wireshark dumps and a lot of pidgin debug logs to get it working. That is a lot of time! It is true that the MSNP16 code was almost complete when I started my SoC work but I though it would be better to start the SLP rewrite over the MSNP16 branch to be able to easily test both codes at the same time and try to get it in a better shape before merging it to i.p.p. I know I have announced this merge like two weeks ago, but you know, I wanted this merge to be followed by a reasonable "beta" testing before being released and at that time it got that we had an security issue and needed to release 2.7.4. Once it was out, there were some ICQ issues that needed a quick release to fix that bugs, so we got a 2.7.5. Now I was able to merge and get a normal release cycle to get beta testers to find bugs in this new and nice code. I hope this code will fix more issues than it brings up, specially the ones related to data transfer. Since most of the code on this area have changed due DirectConn and SLP-rewrite, I guesss it would be a good idea to review and close most of the related tickets since the traceback and debug output would be really useless now. Yei for smashing tickets! I hope you all like 2.7.6 when it get released! disappear because they're treated as HTML tags. This seems to be specific to combinations of Pidgin and other non-official clients. Pidgin recently gained some new ICQ protocol-level features related to formatted messages; some non-official clients, including older versions of Pidgin, don't handle it gracefully. At this point, we've done all we can do about it; the other clients will have to step up and make fixes to handle the messages correctly now. As you know I have been working on a refactor for the SLP code on the msn-prpl for libpurple as part of my Summer of Code. Before I started this project I have been working on adding support for "Multiple Points Of Presence" which are part of the MSN Protocol 16 (MSNP16). Since by the time I started the SoC the msnp16 code was almost complete, I started to refactor the SLP module over the msnp16 code. At some time in the process of the refactio I got an ugly crash from one of the features of MSNP16, the P2P version 2 which uses a different binary header for SLP transfers than the one used before. This bug was caused by some clients not paying attention to the capabilities we expose, we clearly say we don't support P2P V2. To avoid this crash I have disabled MSNP16 in the SLP branch. I have been testing the SLP code for a while with the MSNP16 feature enabled and it looks stable to be merged. The crash has gone, there are some minor changes that must be done, specially UI stuff, the new SLP stack have no known bug. I have updated the SLP branch with the latest changes from the MSNP16 branch, so this branch  have every work waiting to be merged to pidgin's main development branch. This was the first step to get it merge-ready. There have been some testing form some of our closest geeky-friends and now I think it's ready. My plan is to merge the SLP code with the MSNP16 feature enabled the next week to im.pidgin.pidgin. I ask everyone interested in this features to test it before it get to main branch so we can have a softer merging process. Note: This post was wrote 2 months ago and never published, my bad. After some bug squash, I finally got p2p transfers working. I have tested sending and receiving custom emoticons and display pictures, smallers than the SB limit and bigger than that. They just work ok. I guess I need to test some file transfers before thinking my work is done, I also have some cleanup that I want to do but I guess I can declare that the new stack is working nice and is very close to be merge ready. I'm really glad to say so. This announcement comes straight from the developer blog. You need to have set up a username (which you can check here). Casey's blog has all the screenshots you need to figure it out. The only downside is it doesn't use encrypted streams. The biggest problem, though? Having to organize a few hundred buddies into their correct contacts. Direct connections for MSN! What do I mean? Just take a look at the screenshot below. What's that? You don't see it? Just take a look at how fast it's going. Yes, that's right; it's not a pitiful 10KiB/s, but about an order of magnitude faster. It all started with this little patch on trac. But it required a lot of work to get it going. I must have made at least 60 commits just fixing things and getting it to cooperate with aMSN and the official client. I think it should be good now, but you can always disable it in the Account options. It even makes buddy icon and custom emoticon loading faster. Anyway, I promised I would say something about 2.7.1, and here you go. Direct connections will be in 2.7.1. In fact, I'm just about to push all the revisions. Have you ever started committing things in Monotone and then realized "This should probably go in a separate branch"? It's somewhat difficult to fix that. You can add a new branch cert, but the old one won't go away. It's pretty short. Make sure those SQL statements don't break up when you copy it. "DELETE FROM revision_certs WHERE hex(revision_id) = upper('$curr') AND name = 'branch';"
echo "Fixing merge for $curr"
"DELETE FROM revision_certs WHERE hex(revision_id) = upper('$curr') AND name = 'changelog';"
to branch '$NEW_BRANCH' (head $prev)"
AIM and ICQ clientLogin issues have been resolved. You should be able to now use both clientLogin and SSL together. Our internal libgadu has been upgraded from something from the stone age to something much, much more current. This solves the issues that (primarily) Windows users had with not being able to communicate with new (> 17,000,000) Gadu-Gadu numbers. Our Yahoo and Yahoo Japan plugins now retrieve connect server information directly from Yahoo, just like the official clients do. This took me way too much time to implement, but I believe I've implemented a fairly stable and maintainable method to retrieve this information. During this process, I learned a lot about how Yahoo's authentication works and made some improvements there too that will make us look much more like the official client on the wire during authentication. 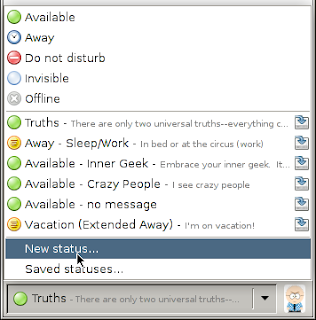 ICQ now has X-Status support! It took far longer than it should have--I originally wanted this in for 2.6.0 but it was nowhere near ready. 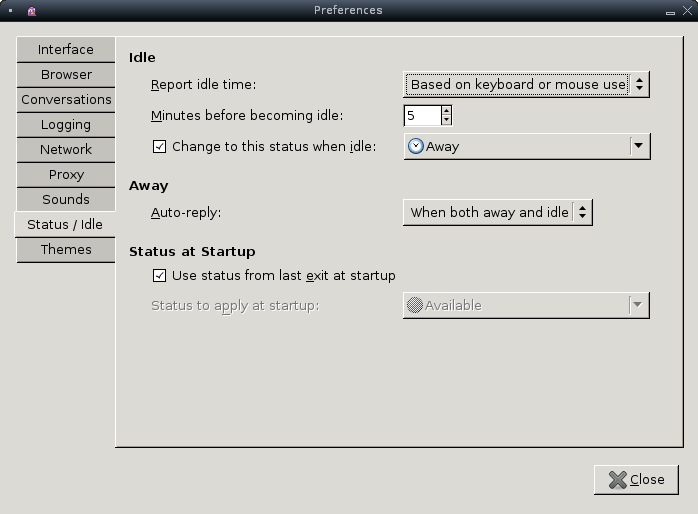 Minimum GTK+ and GLib requirements are now 2.10.0 and 2.12.0, respectively. This allowed us to drop some 3800 lines of code, much of which was the result of needing to bundle certain GTK+ widgets so Pidgin could function on platforms with ancient GTK+. This also makes use of many of glib's convenience functions much more convenient. The Windows installers have changed to be less obnoxious with respect to GTK+. We no longer install a system-wide copy of GTK+ and instead install GTK+ locally to the Pidgin installation. This may disrupt some GTK+ theming. The other big thing is that now, the default installer will download GTK+ and optionally the debug symbols (so there's no longer a special debug installer needed for crash reports!). There's also an offline installer that, while almost double the size of the default installer, I prefer to use. This offline installer includes GTK+ and the debug symbols. I prefer to call it the everything-but-the-kitchen-sink package (the kitchen sink in this case being spell checking support, which still must be downloaded). Of course, any release I had a major role in is bound to have problems. I built the Windows installers this time around, and did not know that I needed to do extra work to make the online installer function. Thus, many of you complained (and complained, and complained some more!) that the installer didn't work. Even after Daniel fixed this for me, we still saw complaints. If the online installer does not work for you, try the offline installer. I tested the offline installer and it worked for me. I forgot, however, to test the online installer. I was more interested in getting the release out in order to (I thought) minimize complaints. Additionally, after I cut the tarballs for 2.7.0, several bug fixes rolled in that will be delayed until 2.7.1. Among these are a couple minor annoyance fixes for MSN and XMPP. And today fixes for more bugs rolled in, including two for Bonjour and a fix for the taskbar entry (window) flashing on Windows. I plan to push out Pidgin 2.7.1 in a couple weeks to resolve these, and hopefully more, problems. In the mean time, enjoy! So it seems like I only post about minor releases (as opposed to micro), but I promise that I'll definitely say something about 2.7.1. Anyway, Pidgin 2.7.0 should be released pretty soon now. You may or may not know that the release versions are dictated by API/ABI requirements. A minor release means we've added API. I wouldn't say there are tons of new user-visible features in this release, but definitely some developer-related things. Most importantly, we dropped support for old GTK+ and GLib, requiring 2.10.0 and 2.12.0 respectively. Visibly, that means we can't support Windows 98 anymore, but I think we can say that's an acceptable loss by now. For development purposes, though, that means a ton of code that can be removed. It means a lot less code that needs to be maintained. We also were able to upgrade some things like from EggTrayIcon to GtkStatusIcon, which is better at integrating into the notification area. Don't worry; it wasn't all development changes. We've also got integrated Mood setting. This interfaces to ICQ and XMPP, so I don't know too much about it. More in my area, MSN gained support for file transfer previews, which show up in the request window and the conversation. There are quite a few other changes that I don't really even know about, so you might want to check the ChangeLog. So last week the accepted proposals for GSoC were announced. Pidgin was given 4 slots. First up, we have Ivan Komarov working on improving ICQ. I don't really use ICQ, so I can't say much, but if you do, hopefully there'll be a lot of great things coming out of it that will be useful to you. Next up is Adam Fowler working on a better chat log viewer. People really seem to complain about what we have now and at the very least, it's kind of slow once you have a lot of logs, so there should be room for some good improvements there. And then we have Gilles Bedel working on detachable libpurple sessions. I'm not sure how often I'd use it, but every once in a while, I feel like checking in on Pidgin from the laptop and it's a very painful process through SSH and D-Bus. This project should make that sort of thing much simpler. Finally, we have Jorge Villaseñor Salinas working on refactoring MSN. So that last one is the one I'm mentoring. Personally, I've been wanting to re-write bits and pieces of the MSN prpl for a while now, but I've never had the time to get around to it. 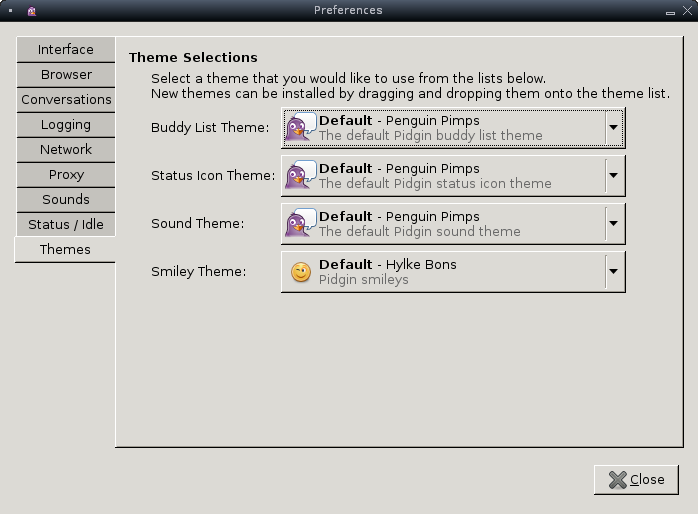 Jorge's already done some great work getting custom smiley support working for Pidgin 2.5.0. I'm sure he'll have no problem re-working the MSN prpl. I'm looking forward to getting a more structured and (hopefully) well-designed prpl which should make development a lot easier and quicker. When I started working on Pidgin eight years ago (eight years‽ holy crap!) my main focus was the code used to connect to AIM and ICQ. The protocol is called ‘OSCAR,’ and it is a proprietary protocol created by AOL. As IM protocols go, OSCAR is actually quite decent. Flexible, extensible, reasonably concise. Could maybe be simpler. AOL’s history with public access to their IM network has had its ups and downs. Sometime in 1999 this project was abandoned by the AOL employees. Some non-AOL employees created a TiK project on SourceForge and continued development. In 2001 AOL made changes to their protocol in an attempt to block unofficial clients. Some people believe these changes were made to block Jabber<–>AIM transports, and that Pidgin (named ‘Gaim’ at the time) got caught in the crossfire. Pidgin developers were able to keep the program working for the most part, and AOL relaxed their efforts to block unofficial clients. In 2008 AOL announced Open AIM. Open AIM was a lot of things: A set of SDKs for interfacing with AIM and the AIM servers. Documentation for the OSCAR protocol. A forum for users to ask questions. Things were great… for a time. Sometime in January, February or March of this year AOL decided to shut down the Open AIM program. No more SDKs, no more protocol documentation, and no more developer outreach. More specifically, the OSCAR documentation provided by AOL described a method of authentication (using a “startOSCARSession” API request) that required the use of a developer application key. The current Open AIM website implies that new keys cannot be created. Does this mean the use of startOSCARSession is deprecated? If so, what auth scheme should we use, instead? Should we go back to BUCP, the authentication scheme used by AIM 5.9? Should we try to reverse engineer the authentication scheme used by current version of AIM? Should we go back to masquerading as the official AIM client and stop politely identifying ourselves as ‘Pidgin’? On The Subject of Bugs, or Help Wanted and Needed! As bug master for Pidgin, I bear a lot of the responsibility for triaging bugs--getting them assigned to the appropriate developers, weeding out the invalid bugs, etc. I admit that lately I’ve not been doing such a good job at this. I’ve been ignoring Pidgin so I could relax and unplug somewhat after the stress of work. Thankfully, in my increased absence, my fellow developers, particularly Paul, Daniel, and Elliott, have been picking up the slack. All the while, however, not much has changed as far as actual ticket resolution goes. Now, yes, on an IM service level, MSN has more open tickets than any other listed service. However, looking at the underlying protocol for these services, AIM and ICQ combined give the OSCAR protocol a 41-ticket lead. Google Talk is an XMPP service, but even combining Google Talk and XMPP numbers, we come up with 50 tickets, trailing MSN by 20. None of our other listed IM services share an underlying protocol with another. In fairness, the unclassified bugs really should be sorted into proper components, which would change these numbers, but at this time I don’t know by how much. Now, looking at the IM services we support, many of them don’t have a current “maintainer” who is ultimately responsible for the plugin. Currently, Zephyr, Yahoo, SIMPLE, SILC, Sametime, MySpace, Groupwise, Bonjour, and QQ either have no “official” maintainer, have no one at all working on them, or haven’t had meaningful development activity in at least three months. Obviously, protocols without an active maintainer are not going to see much in the way of quick bug resolution. We’re all volunteers. Not a single one of us gets paid to put any time or effort into Pidgin. Not all of us use all the services we support. I’ll use myself as an example here. I use AIM, ICQ, Yahoo!, and XMPP regularly. I also have an MSN account that I couldn’t possibly care less about and a couple IRC accounts for the rare instance that I need to test something with the Purple Plugin Pack. I don’t use, nor do I have interest in using, any of the other services. We all have families that we’d like to spend time with. Many of us have spouses/significant others, and a few of us also have children. Family is a demand on our time that should never be ignored. All (or almost all) of us have jobs. Since, as I already mentioned, we’re volunteers, the jobs with which we earn our paychecks have to take priority. We’re human too--we get burned out, experience stress, need to unwind after work, etc. Not all of us know anything about a given protocol, nor can we be reasonably expected to. For example, I don’t know how the MSN protocol works, and I have no desire to learn about it. We don’t have to be experts in a given protocol if we don’t want to be. Also, the fact that MSN is allegedly the most-used protocol in the world is not a valid reason for anyone to expect us all to be experts on (or even to care about) the protocol. Pidgin largely just works for us. If we don’t see a bug, we’re not going to be irritated by it and sit down to try to fix it. So yes, we have been “neglecting” Pidgin to a certain extent. Our time is a precious resource, and in many cases we simply have better things to do or simply don’t have the time to sit down and attack bugs to get them closed. That’s not to say that our development process is coming to an end or that we’re abandoning Pidgin, though. We do, however, readily admit that we need fresh blood. In that vein, I’m calling for you, the Pidgin community, to help us. Take a look at the open bugs and feature requests and submit patches to resolve them. Pidgin is a fairly complex beast, and there’s a lot of code to maintain, but it is manageable if people work on small changes at a time (instead of completely rearranging things unnecessarily). Additionally, Pidgin uses a distributed version control system, monotone. Contributors who want to seriously work on Pidgin can use this to their advantage by creating their own branches in monotone. When contributions are ready, those contributors can submit the changes from their branches either by attaching patches to tickets on trac or by asking a Pidgin developer to pull and review the changes. At that point a developer can commit or merge the changes and push them on to the central repo at mtn.pidgin.im. The only problem with the model of a developer pulling changes from a contributor is that in order for someone to pull revisions, the contributor must be able to run mtn in server mode, which isn’t always possible or feasible. I’m trying to come up with some custom lua code to help in this regard, to do something similar to what git and hg can do with emailing patches, but that’s going to take some time, as I need to learn some more of the internals of monotone first. But none of this should stop anyone from trying to contribute! We will still accept single one-off patches or sets of patches and series of patches from longer-term contributors, and using monotone to develop against is going to produce patches that are the easiest for all of us to work with. So, yes, in short, Help Wanted and Needed! Sooo, Pidgin supports voice and video now. 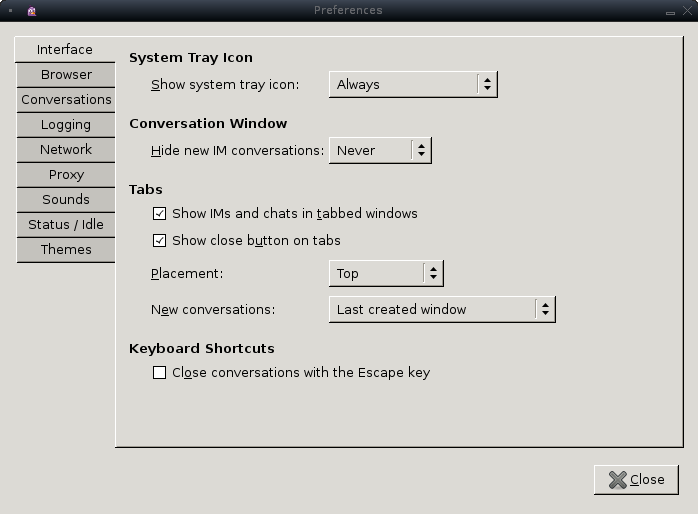 It's only on XMPP (aka Google Talk), and only on Linux, but hopefully that will change soon. I hear it's a real pain to get all the farsight/gstreamer dependencies compiled for Windows right now. And here's hoping we can get MSN support soon, too. I'm not too sure how well farsight supports it though. This has been on my todo list forever, and I started tinkering with it the other day. But after a mega hackathon tonight, I have a pretty functional gtkdoc plugin from trac. The idea of the plugin is to integrate gtkdoc books into trac's interface. This is accomplished, currently, by and iframe displaying the actual htlm output of gtkdoc, as well as integrating into the search engine in trac. There's two new user permissions in this plugin, GTKDOC_VIEW and GTKDOC_ADMIN. GTKDOC_VIEW is obviously to view the api and well as search it, where admin allows the addition and removal of books. As mentioned above the admin interface provides an interface for adding and removing books. Books are keyed on a name given to them at the time they're added, as well as an absolute path on the local filesystem of where the book actually is. This way, you can update the documentation and not have to touch a thing in trac. At any rate, it's still pretty rough around the edges and lacking a ton of error checking. But feel free to grab it from our extras repo (hg clone http://hg.guifications.org/extras) and tinker with it. It's in trac/gtkdoc, use the normal "python setup.py bdist_egg" to build it. Last weekend Google hosted their 3rd annual mentor summit, following the end of their 4th annual summer of code. The mentor summit is when a few hundred mentors gather together and participate in an unconference style conference. I went for the Pidgin project, along with Gary Kramlich and Ethan Blanton. Children in third world countries generally want to learn–more so than children in the US. They realize that education can help them achieve something greater in life. And computers are interesting to them. Combine students, computers, and engaging lesson plans about math, geography, etc. and the students will have a more varied education and will learn better. Forking helps keep people motivated. It increases competition, keeps developers on their toes. A fork could be like a “research and development” branch. People work on crazy fun new features in the forked project, and the good stuff gets merged back into the original. The smaller the project, the more willing the maintainer should be to give people access. There is a natural inclination to be protective of your project–it’s your code, your baby. But you must be willing to give up control for there to be forward progress. This reminds me of dictator governments like Cuba/Fidel Castro and North Korea/Kim Jong-Il. The dictator is afraid to relinquish control for fear of what might happen. Benefits of a fork? Developers have more freedom to do what they want, which allows for innovation. The best project will survive–if developers want their project to survive then they must make decisions that benefit the community at large. Downsides of a fork? Development effort is divided. Users might not know which project to use. Distributors may not know which package to distribute; distributing both means more work. TURN – A protocol used to proxy traffic through an intermediate server. Written with SIP in mind. Increases the likelihood of being able to establish a connection to another party, but it also introduces an additional hop, which leads to lagginess, which is bad for voice/video communication. ICE – A protocol that describes a method for establishing a direct connection with another peer. Written with SIP in mind. It uses an exhaustive algorithm to try every possible IP address for yourself in the hopes that one will work. You construct a list of your host’s IP addresses plus your public IP address determined by using STUN. This information, along with a fallback TURN server, is sent to the other party, who begins attempting to connect. A little while ago, grim posted a link about preparations for GTK+ 3.0. I started a bit of work on it in a separate branch. So far, it hasn't been too much trouble. I managed to fix single includes in the main branch, and all deprecated functions in libpurple core too. Finch was super-easy and required almost no work. What was left was the Pidgin UI. The main Pidgin UI required a bit more work. Replacing GtkOptionMenu with GtkComboBox was pretty simple, just a couple preprocessor checks needed. 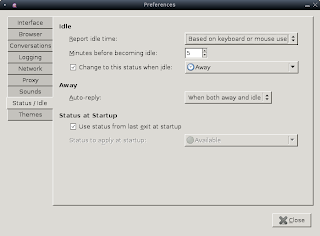 Using GtkTooltip instead of GtkTooltips was also pretty painless, but there's still one matter left. The headline text that goes in the buddy list for mail notification used to do a hack with the tooltip to colour it correctly. At the moment, it ends up grey because I'm not sure how to get it working. There are still a couple big changes left. I still really don't know how to write UI Manager stuff, and it's hard to find good examples. It only has to be done twice, for the buddy list and for the conversation window, but I'm not sure how much that really means. Fortunately, we are not heavily GNOME dependant, so that's probably the biggest change. I haven’t written about this before, have I? I think the world is better off with free software. I don’t have anything against closed source or non-free software, I just think typical development processes for free software produce better products in the long run. They produce something that meets the needs of users better, with less fluff. And I guess I feel like I can have a positive impact on open source software. Working on Pidgin is like my way of giving back to the authors of all the other free software that I use. And I take a lot of pride in the code that I write. It is a reflection of who I am. If I write something that’s buggy then it makes me look bad. So you don’t need to try to talk me into fixing something that I wrote, because I care regardless. I care a lot more than you do, believe me. And it pains me when I don’t have time to fix my bugs.